What happens at home is EVERYTHING to a preschooler. Preschool family activities can and should be talked about in preschool and this family preschool theme activities page will help! This gives your students the opportunity to talk about the people most important to them and also helps them realize that family, the people we live with, is something we all have in common, regardless of how our families look! Some families have siblings, some have none. Some have parents, some have none. This theme page is filled with preschool activities and ideas for all areas of your classroom. Other Themes That May Compliment this Theme for your Classroom! There are many other themes that may be great for your classroom and go along very well with this theme! Below you will find links for a few of them such as All About Me and a Pets Theme! Let the Preschool Family Theme planning begin! The children use the materials to make the faces of members of their families. Ask questions to help them such as "What color eyes does your Mom have? What color hair? Does your dad have a beard?" The children use the sponges to create their own family. Be sure to write the names of the people they list! VARIATION: Use playdough cookie cutters (people shapes) to dip in the paint. DON'T FORGET TO ADD SOME PET SHAPES, THEY ARE PART OF OUR FAMILIES, TOO! Traditional but fun! In advance, have a huge selection of pictures cut from magazines of people, families doing things together etc. The children choose what they want to make a collage of family fun. SUGGESTION: Ask parents in advance to cut pictures out for you either from magazines you have or ones they have at home. Add a dollhouse, cars and little people to you block area. Begin your theme with this activity! In advance, cut out many, many little people shapes. Prepare a large chart that has the children's names in the left hand column. Ask each child who is in their family. The child tapes a person shape next to their name for each person (Mom, me, Grandma). Print the names on their little people before they tape it. How many of us have brothers and sisters? How many brothers and sisters in all? Use a puppet to talk to the children about their families! Have your puppet talk about their family and, one by one, the puppet asks each child who lives in their house! Bring a large piece of chart paper and a marker to Circle. Ask the children what types of jobs their families need to do at home and what jobs they can help with. This is a job we do at home at home, do at home, do at home. This is a job we do at home, my family and me! You may need to start by suggesting a job--perhaps doing dishes, folding clothes, washing the dog, etc. List the jobs the children name. EXTENSION: As each child names a job and you are writing it on the chart, sing the above song while the child acts out the job! Bring a large piece of chart paper and a marker to Circle. Ask the children what types of things their families do together and list them on the chart. Again, you may need to start by suggesting: We make tacos every Friday night; we have a game night; we visit Grandma at the nursing home, etc. Ask questions that describe something a family member does at home. Let the children answer, and remember, there is no right or wrong answer here! Dads might be the ones to cook at home or Moms do the driving! I am thinking of a family member who cooks dinner; does dishes; feeds the dog, etc. Fingerplays, Songs and/or flannel board stories! Adapt them in any way! Tell me what you like to do, like to do, like to do. Tell me what you like to do with your family. Cheryl likes to walk the dog, walk the dog, walk the dog. Cheryl likes to walk the dog, with her family! A bathroom, a bedroom and a room for you! An attic and chimney and a roof above. My house is a home and it's filled with love! Snack Recipe Ideas to Cook Up for Your Preschool Family Theme! At snack time, put out some blankets and have a preschool family picnic style snack or lunch! If you have cooking ideas to add to the preschool family activities theme section, please use the "Contact Me" link to the left and I'll add it to this page! Please be sure to tell me the name of the theme! Thanks! One year, we had 3 children move during the school year. It can be a stressful event! Provide an opportunity for the children to pack and move by setting up dramatic play with lots of toys, clothes, boxes and bins. In advance, have a large supply of pre-cut people shapes for the easel (babies, adults, children, pets). The children choose the family members they want to paint. Preschool Family Theme Large Group Games To Help Build Their Muscles While They Have Fun Together! the park, school, work, supermarket, etc. Provide the driver with a makeshift steering wheel and the others with activities they might do in a car. Hang a LARGE piece of flannel on the wall that is separated into rooms. Provide flannel pieces in shapes of people and household items for the children to place on the board. This would work well in your manipulatives center as well on a smaller scale! Preschool Family Theme Activities to Help Your Preschoolers Develop Their Math Skills and the Small Muscles in Their Hands! In advance, cut out pairs of people (adult woman, man, child, baby, grandparent, pets). Tape one set in a manila folder. The children match the people shapes. In advance, cut out and laminate a large number of people, families and others that go with this preschool family activities theme from magazines. Simply place them at the table for the children to sort in different ways. Of course! Have many family puzzles available during this theme! Preschool Family Theme Music and Movement Activities and Ideas to get your Preschoolers Movin' and Groovin'! Farmer in the Dell Thanks, Kaleena, for this idea! Have the children take turns acting out the farmer in the dell. The children love singing and choosing each character over and over again. Preschool Family Theme Ideas for Your Sand and Water Table! Okay......again, as in the Blocks area activity, I am asking you to be brave and go a little crazy here! At a table, provide free standing hand mirrors, whipped cream, a clean brush and tongue depressors. Let the children shave......and eat! Of course, be sure to talk about the fact that this is PRETEND and that they should never, ever do this at home! What color would they choose if they could paint their house?? Find out in the preschool family activities theme science idea! Materials needed: Provide paint cups with different colors of water in each. Provide each child with their own clear paint cup and a pipette. Teach them how to use the pipettes. Let them create their own colors. I'd suggest having a few pitchers of water a large bin. They will want to empty their colors and start over many times! Writing Activity Ideas for Your Preschool Family Theme! At the end of the unit, you will have a great family book to send home. VARIATION: Use this idea for a Thanksgiving or Christmas theme activity or end of the year activity. Encourage children to draw a picture of some fun preschool family activities they enjoy doing with their families. Print their stories on the page. EXTENSION: Make this into a class book and read it at circle time. EXTENSION: If you have the ability, make color copies so that each child can take a copy of the book home. Use their original paper as their book cover. In advance, cut family member pictures out of magazines, old books, etc. 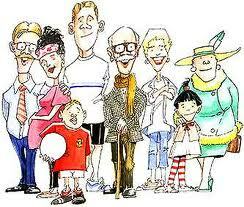 Encourage the children to draw a family picture and write down the story they tell you about their picture. These also make GREAT classroom books to read at Circle Time! Miscellaneous Activities for Your Preschool Family Theme! Send a note home to families asking them to make a family banner or collage of the people in their families. Ask them to label the pictures by printing the name of each person under the pictures (the banners will go home after your theme is over). As children bring them in, let them tell their friends about their family at Circle Time and then hang the pictures in the classroom to see during the theme! A Preschool Family Activities Theme is a great opportunity to involve families in the classroom! We had a family this year bring in their Bearded Dragon on Show and Tell Day! Invite a parent to bring their baby in and talk about the jobs involved in being a parent. Invite a grandparent to visit and talk about things they like to do with their grandchildren.